The progressive Doha Metro Rail Project is a planned rapid transit system in Doha to facilitate smooth commutation to people in Doha. The project was necessitated with the urge to modernize the commutation and at the same time deal with traffic related issues such as jams, accidents, pollution and undue delays. As per the recent inspection conducted by Prime Minister and Minister of Interior H. E. Sheikh Abdullah bin Nasser bin Khalifa al Thani, on Tuesday at Economic Zone Station, the project has reached 73 percent of completion stage and is expected to approach the end by 2018 and will be complete in 2019, much before being fully operational in 2020. As planned, Doha Metro is expected to have four lines. These four lines will intersect the country to provide maximum travel coverage. The Red line will cover the costal part of the country while connecting the towns of Al Khor in the north and Mesaieed in the south via Lusail, West Bay, Msheireb and the New Doha International Airport (NDIA). The green line would serve as an education line, follow Al Rayyan Road connecting Education City with the Heart of Doha. Furthermore, it would link to Umm Slal and the Industrial Area South. The Gold line will serve as a historic line from East-West direction and connects the Airport City North via central Msheireb with Al Waab Street, Al Rayyan South and Salwa Road. The Blue line would serve as City line that will connect the residential and commercial areas of West Bay and Airport City North along the main C-Ring Road. The project, despite having various infrastructural challenges due to the GCC blockade, has achieved a considerable momentum. Given the success of Metro trains in countries around the globe, the project will mark a solution to a lot of major traffic problems while easing the excess flow of vehicles as the technology is extremely time saving. However, we hope that the modern technology may not be expensive than the existing transportation structure. In the initial stages of project, Qatar Rail’s, Saal al Mohannadi, assured that the operational cost of the project will be recovered by renting out sites, services and advertisements, along with revenue from ticket sales. He assured that tickets will be affordable for everyone. Hopefully, the case is still the same as most of the people who will prefer traveling by metros will be the ones looking forward to saving both time and money. Hence, the purpose of the project could only be realised keeping the affordability as a priority. The Doha Metro came one step closer to reality this week after Qatar Rail tested its first train. In a video posted by the transport ministry, the train could be seen racing down a short length of track. According to Japanese manufacturer Kinki Sharyo, the train had been designed with German company Tricon Design to reflect Qatar’s culture. Qatar’s Emir “personally selected” the exterior design of the train, which used the Arabian horse as inspiration for the sleek, shaped front-end of the Metro vehicles, the company said. Qatar Rail took delivery of four of its 75 driverless trains last month. At the time, the company said the trains would be transported from Hamad Port to its Al Wakrah depot, reassembled and then tested to ensure safety standards. Testing is supposed to take place at three trial stations on the Red Line by year-end. When Phase 1 of the Doha Metro launches to passengers in 2020, a total of 37 stations will operate across three lines – Red, Green and Gold. The first four trains that will run on the Doha Metro arrived in Qatar yesterday, in what is a landmark moment for the infrastructure project. 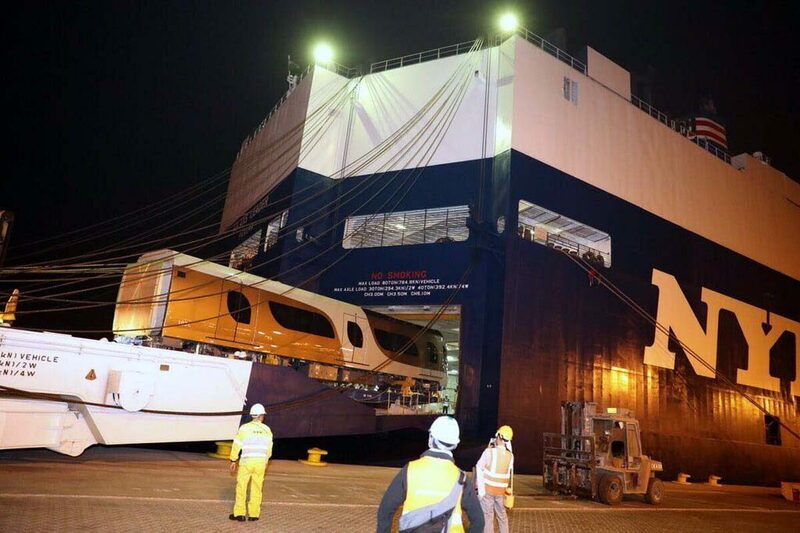 After a three-week journey by sea from Kobe in Japan, the new carriages were welcomed by officials into Hamad Port last night, Qatar Rail said. This is the first batch of some 75 trains that will run on the new driverless rail network, which opens to the public in early 2020. According to Qatar Rail, the trains will be transported to its Al Wakrah depot, reassembled and then tested to ensure safety standards. In a statement, the company said the trains were delivered some two months early. Photographs showed the carriages being offloaded from a ship. In another shot, workers posed by a carriage that was draped in a banner bearing the now-iconic image of Qatar’s Emir, Sheikh Tamim. Qatar Ports Management Company (Mwani) also tweeted about the trains, posting a short, time-lapse video showing the carriages arriving on Qatari soil. Last month, Qatar Rail said it aimed to receive and start testing its first consignment of trains before the end of this year. To do this, it aims to have three trial stations on the Red Line up and running by then. When Phase 1 of the network launches in 2020, a total of 37 stations will operate across three lines – Red, Green and Gold. All the trains on the metro will be driverless and fully automatic, similar to the Dubai Metro. Each will have three carriages, and are being manufactured by Kinki Sharyo Co, based in the Japanese city of Osaka. In a statement on its website, Kinki Sharyo said the train had been designed with German company Tricon Design, to reflect Qatar’s culture. Qatar’s Emir “personally selected” the exterior design of the train, which used the Arabian horse as inspiration for the sleek, shaped front-end of the Metro vehicles, the company added. There will be a dedicated zone for women and children, while seats in the standard class are arranged as a “side bench,” Kinki Sharyo added. All the carriages will also be fitted with large screens that give passenger information and show a route map. Meanwhile, work on the Metro stations is picking up pace. 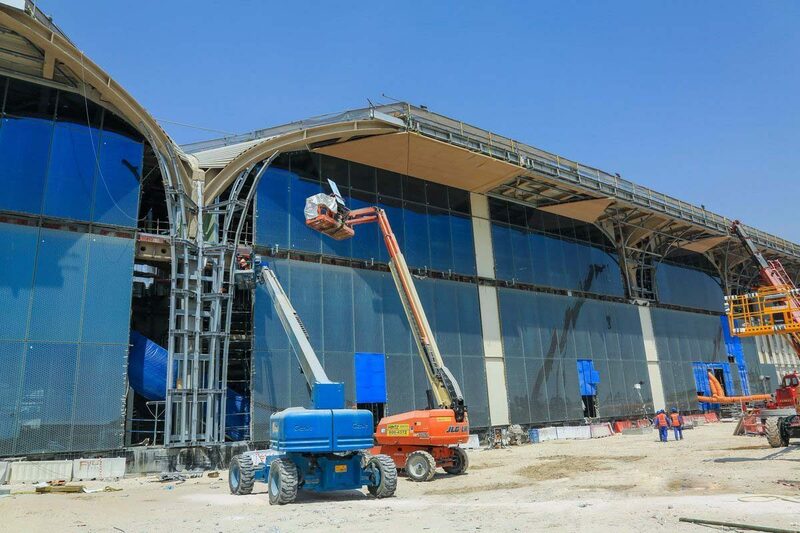 Earlier this month, Qatar Rail posted sneak-peek pictures of construction progress at some of the stops. Glass facades, sweeping roofs and elegant vaulted ceilings could already be seen in place at some stations on the Red Line. The Gulf crisis created supply chain problems, getting glass panels for the front of at least one of the stations. “Any doubt that the project will be delayed in light of external factors has been relinquished by the hard work and dedication of the Qatar Rail team,” he added. Who’s excited about traveling on the Metro? Thoughts?